Do you want to generate up to 25% more electricity from your solar panel system? The new PV PLUS from The Renewable Energy Hub can help solar panel system owners achieve a much better return on investment. 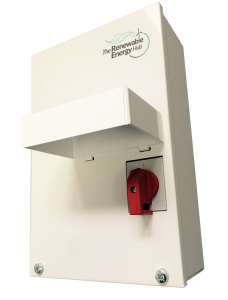 The PV Plus unit simply replaces the isolator switch for your inverter. If your incoming mains voltage is below 243 volts do not buy this unit. 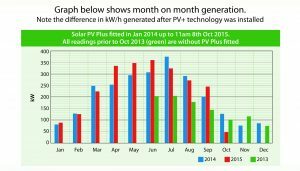 How does the PV Plus help? The PV Plus works by monitoring the incoming supply voltage to your home or business, it then prevents your inverter from shutting down due to overvoltage, this occurs when the mains electricity voltage peaks too high. 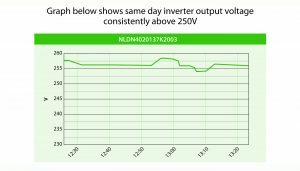 When this happens your inverter shuts down, doing so stops your PV system form generating free electricity. An added bonus of the PV Plus is that it takes the stress from your inverter, potentially prolonging its lifespan. The readings in GREEN are PRIOR to the Solar PV Plus being installed. 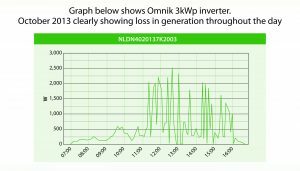 All readings are from a 3KW inverter by the same manufacturer. October 2015 is only until the 8th when the data was compiled for this graph. The PV Plus is designed for all DC applications for solar panels systems. When your solar panel system is generating at full capacity, your inverter could be pushed into over-voltage mode and not generating at all! This loss in generation will be costing you money. 7.7.1 Voltage Management Units are becoming more popular and use various methods, in most cases, to reduce the voltage supplied from the DNO’s System before it is used by the Customer. In some cases where the DNOs System voltage is low they may increase the voltage supplied to the Customer. Some technologies are only designed to reduce voltage and can not increase the voltage. 7.7.2 The use of such equipment has the advantage to the Customer of running appliances at a lower voltage and in some cases this can reduce the energy consumption of the appliance. Some appliances when running at a lower voltage will result in higher current consumption as the device needs to take the same amount of energy from the System to carry out its task. 7.7.3 If a Voltage Management Unit is installed between the Entry Point and the Generating Unit in a Customers Installation, it may result in the voltage at the Customer side of the Voltage Management Unit remaining within the limits of the protection settings defined in section 10.5.7.1 while the voltage at the Entry Point side of the unit might be outside the limits of the protection settings. This would negate the effect of the protection settings. Therefore this connection arrangement is not acceptable and all Generating Units connected to DNO LV Systems under this Engineering Recommendation must be made on the Entry Point side of any Voltage Management Unit installed in a Customers Installation. 7.7.4 Customers should note that the overvoltage setting defined in section 10.5.7.1 is 4% above the maximum voltage allowed for the voltage from the DNO System under the ESQCR and that provided their Installer has designed their installation correctly there should be very little nuisance tripping of the Generating Unit. Frequent nuisance tripping of a Generating Unit may be due to a fault in the Customers Installation or the operation of the DNO’s System at too high a voltage. Customers should satisfy themselves that their installation has been designed correctly and all Generating Units are operating correctly before contacting the DNO if nuisance tripping continues. Under no circumstances should they resort to the use of Voltage Management Units installed between the Entry Point and the Generating Unit. You can BUY the PV Plus unit FULLY INSTALLED in our Marketplace. Next PostNext Is it Time for a Tidal Power Revolution in the UK?